After listening to last week’s Pen Addict podcast I thought I should really spend some time finding out more about bullet journalling. I have of course heard about it in the past, but never spend the time to learn about it. 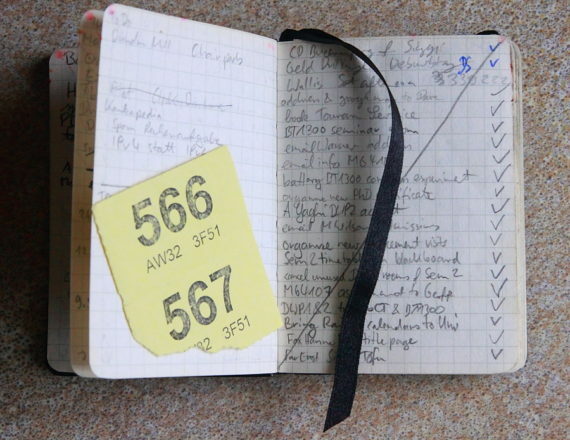 The podcast made me think about how I use notebooks now and how I used to use them. I used to think that I use them like everyone else, but I remember that the post about my Brunnen Kompagnon once had a pingback from a Russian website and when I used Google Translate back then, to see what it is about I saw that they commented that I use a specific system1. I just checked the pingback again, it’s mentioning a system called ‘superfocus’ – well, something else to read up on another day. I usually leave the first page blank so that I can then create an index – I don’t always create the index,though. The picture on the right shows an example. I write what’s on the page and draw a line to the right. I will then mark the corresponding page at that spot to make it easy to access. 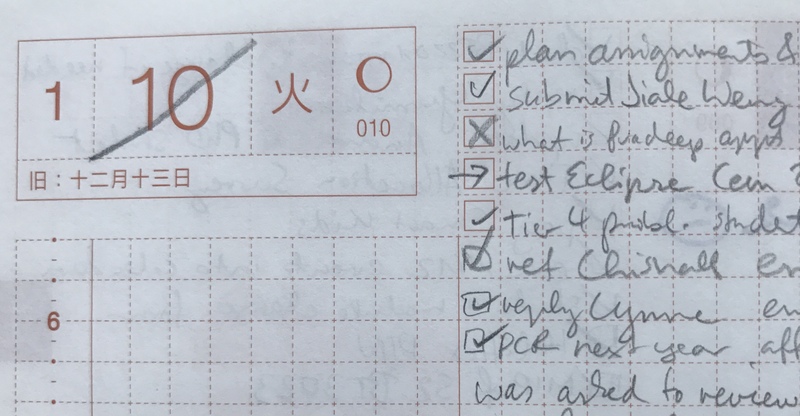 In terms of Hobonichi use: I will tick off tasks I have done. If I haven’t done a task I won’t tick it off or I will put a cross in the box. 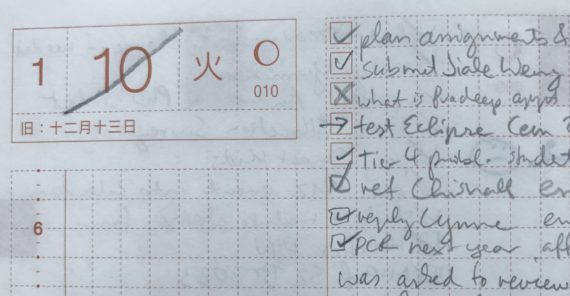 I only cross the date out (in the image below the 10 for 10th January) once all tasks are dealt with, but I do sometimes move tasks to a future date, indicated by putting an arrow to the right in the box. By the way, I never got an English Hobonichi explanation with my orders, probably because I ordered the ‘avec’ version, which is only available in Japanese. When I ordered the Hobonichi cover on discount, mentioned in my last blog post, I got an English language explanation. Turns out their system is so well designed and intuitive that I used it the right way, i.e. 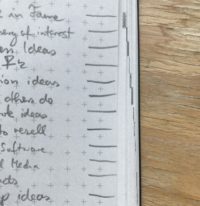 using the space left of the vertical line on a page for appointments and the space on the right for notes (unless the appointments need too much space). 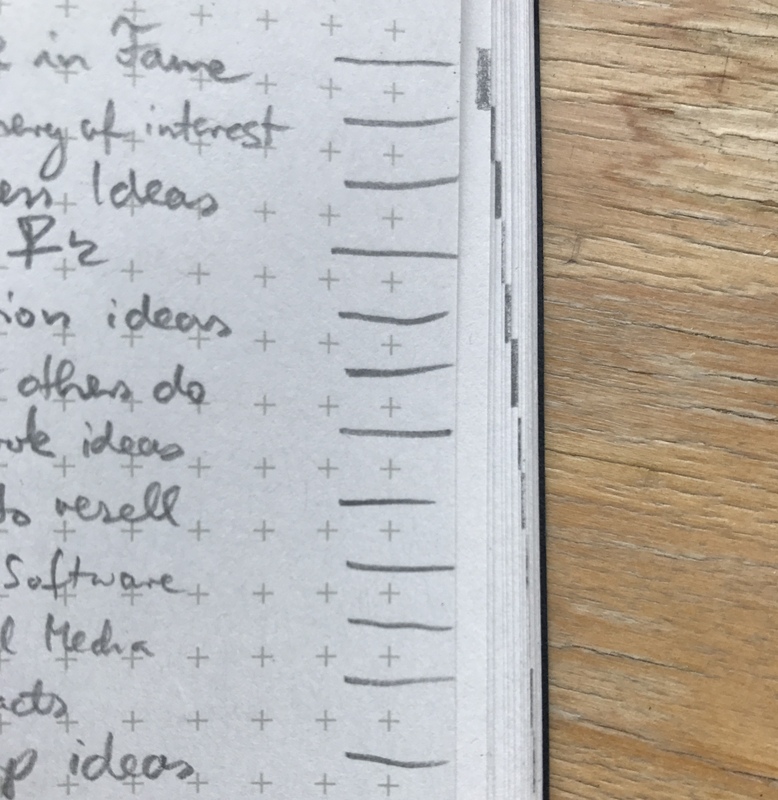 I have tried bullet journal with Hobonichi Weeks and in my perspective, it takes a lot of mindful planning and using, especially with tasks that need to move migrated and consolidated. Perhaps I am naturally ill-organized, but I have heard this system works wonder for many others. Maybe the goal for me next year is to actually use Hobonichi Techo as a planner instead of a diary; however, I kept eyeing at Roterfaden planner.. I seem to suffer from the Goldilocks syndrome! I had a look at the short bullet journal video. Like you I’m not sure this is the right system for me. The effort involved feels like you have to use it properly, but using it properly seems like a lot of work if there are many small tasks that only take a few minutes each and come at short notice and need to be dealt with in a short time frame – a situation I have at work. The Roterfaden is very tempting. A few months ago I nearly bought one. Do you have plans how you would use it? I have always wondered why people have multiple planners and just recently, I have discovered I am one of those: I dedicate one planner to work and the other for home/personal purpose. Even though it sounds cumbersome, ideally I like to have them both together so everything can be in one place. Roterfaden is attractive for that purpose. I am also intrigued by their planner layout. With that said, many reviews indicate that Roterfaden can be on the bulkier side, but if that would be the only item I carry, it won’t be too burdensome. On some of the photos it does look rather big and thick. The Hobonichi weeks is quite slim, so the space wouldn’t be used in an ideal way if you put it in one of the holders, unless you slot it in a pocket instead. I hope this will work for you and I’m looking forward to reading about it in your blog. The newest development in my perpetual Goldilocks syndrome is opting out on Roterfaden for its propensity to become bulky. The system also reminds me of Midori’s Traveler’s Notebook, which I have failed utterly to use effectively. Most likely I will be a Hobonichi purist again the following year, but I may try the larger one-volume Cousin to see whether I can do away with two planners. It seems that I am just having a perennial planner debates here! I hope your new approach will give great results. Did you buy a Roterfaden and found out, in that case: how will you use it now that it has been repurposed – or did you find out by reading about it.